The repair of nervous system injury has been a hot and difficult topic. Our previous studies found that in ischemic stroke causes neural stem cell injury. MicroRNA125 expression level showed significant changes, suggesting microRNA125 may play a role in the regulating proliferation and differentiation of neural stem cells damaged by ischemic stroke. This study was to investigate the function and molecular mechanism of microRNA in the regulation of proliferation and differentiation of neural stem cells from patients with ischemic stroke. The rat model of ischemic stroke was established. Neural stem cells from ischemic stroke rats and control rats were collected. MicroRNA125 expression level was measured by RT-PCR. Rat neural stem cell RNSC-FMU1 was cultured and transfected with microRNA125. Flow cytometry and MTT assay were used to detect the apoptosis and proliferation of RNSC-FMU1 cells. The levels of microRNA125 in neural stem cells of ischemic stroke model were significantly higher than that of controls (P=0.017). Targeting microRNA125 by antisense siRNA reduced the growth of RNSC-FMU1 cells (P=0.0081) by induction of apoptosis (P=0.0082). Overexpression of microRNA125 promoted the growth of RNSC-FMU1 (P=0.019) and reduced the apoptosis (P=0.026). microRNA125 may be related to the repair of neural stem cells damaged by ischemic stroke. Decreasing the level of microRNA125 decreases the growth and proliferation of RNSC-FMU1 cells and induces RNSC-FMU1 cell apoptosis. Increasing the level of microRNA125 enhances the growth and proliferation of RNSC-FMU1 cells and reduces the apoptosis of RNSC-FMU1 cells. With the accelerated process of industrialization, incidence of cardiovascular and cerebrovascular disease especially ischemic stroke is increased year by year . Ischemic stroke with nerve injury seriously affect the life and health of patients . Our previous large-scale screening experiment suggests that ischemic stroke with nerve injury affects the proliferation and differentiation of neural stem cells. The expression levels of microRNA125 showed significant change, suggesting that microRNA125 may play a role in  the proliferation and differentiation of neural stem cells damaged by ischemic stroke. MicroRNA is a kind of non-encoding small RNA  which has regulatory role in a wide range of biological processes, including cell cycle , cell proliferation and death , signal transduction , cell organ reconstruction , autophagy , and cell apoptosis and programmed cell death . Therefore, exploration of the function and mechanisms of microRNA in the growth and proliferation of neural stem cells damaged by ischemic stroke is of great significance and may provide theoretical basis for the treatment and prognosis of nerve injury in ischemic stroke. Studies show that the repair mechanisms of neural stem cells damaged by ischemic stroke include the following aspects: (1) rats and other mammals have some number of neural stem cells in the brain which can be activated by nerve injury in ischemic stroke. The activated neural stem cells will proliferate and differentiate rapidly [11,12]. Activated neural stem cells are directly involved in parts of the neurons repair . (2) Nerve cell apoptosis was increased but growth was inhibited , which is one of the important causes of ischemic stroke nerve injury. Neural stem cell research shows in ischemic stroke after nerve injury, neural stem cells released a large number of protein factors. These protein factors caused increase of neuronal activity and acceleration of proliferation  to repair nerve injury. (3) The regulation of gene expression is also considered to be one of the key factors that cause the proliferation of neural stem cells after ischemic stroke . Studies showed  that neural stem cells are involved in the regulation of repair of nerve injury after ischemic stroke by the quantity and activity of their genes. These genes can directly or indirectly inhibit neuronal apoptosis and promote proliferation. Data suggest that microRNA125 may play a role in the pathogenesis of ischemic stroke. This study was to investigate the function and molecular mechanism of microRNA125 in the regulation of proliferation and differentiation of neural stem cells from ischemic stroke models. MicroRNA125 is an important non-encoding RNA [18,19]. However, the role of microRNA125 in the growth and proliferation of neural stem cell line RNSC-FMU1  is not clear. In this study, the role of microRNA125 in growth and proliferation of RNSC-FMU1 will be investigated. RNSC-FMU1 cells were kept in Shangdong University. Caspase-3 activity detection kit and FITC-Annexin-V apoptosis detection kit were purchased from Biyuntian Biotechnology Research Institute and Beijing Guoding Biological Engineering Co., Ltd. MTT kit was purchased from Shanghai Baili Biotech Co. ltd. Lipofectamine 2000 was purchased from Beijing Dingguo Biological Engineering Co., Ltd. Primers of microRNA125 and actin were designed by our lab and were synthesized by Beijing Sanbo Biological Technology Co. Ltd. siRNA of microRNA125 and control siRNA were synthesized by Shanghai Biotechnology Co., Ltd.
Culture conditions of RNSC-FMU1 cells are as follows: first the cells were taken from liquid nitrogen and put a 37°C water bath to quick unfreeze, followed by centrifugation at 800 rpm for 5 min. Removing Preservation liquid was removed, cell pellet was resuspended in 5 ml of DMEM culture medium with 10% fetal bovine serum , and cultured at 37°C with 5% carbon dioxide for 48 h. Cells were then split and cultured for transfection or other experiments. Transfection of RNSC-FMU1 cells with liposome was carried out according to the method published previously . microRNA125 siRNA and control siRNA sequences are as follows: 5'CGCCAGGGTTTTCCCAGTCACGAC3', 5'AGCGGATAACAATTTCACACAGGA3', 5' GGGCTGGCAAGCCACGTTTGGTG 3', 5' CCGGGAGCTGCATGTGTCAGAGG 3'. RNSC-FMU1 cells were transfected for 12 h.
MTT assay was performed according to the instruction of the kit. Briefly, 2000 RNSC-FMU1 cells were inoculated into each well of 96-well plates and cultured at 37°C for 24 h. MTT reaction solution was added to each well (6 mg/ml) and incubated at 37°C for 8 h. 80 μl of DMSO was added to each well to stop the reaction. The optical density at 490 nm was measured by microplate reader. Analysis of apoptosis was performed according to instruction of kit . Briefly, RNSC-FMU1 cells were centrifuged at 600 rpm for 5 min. Cell pellets were re-suspended in DMEM. The reaction solution was added to the cell suspension and incubated at room temperature for 15 min. FITC-Annexin V was added to the cell suspension and incubated at room temperature for 5 min. The apoptosis of RNSC-FMU1 cells was detected by flow cytometry. The expression of microRNA125 in RNSC-FMU1 cells of treatments were analysed by RT-PCR . ImageJ software was used to quantify the gray value of the RT-PCR band. The expression level of microRNA125 was expressed by the ratio of gray value of microRNA125 band and the gray value of actin. The detection of caspase-3 activity in  was performed according to the manufacturer’s instruction. A rat model of ischemic stroke was established by Beijing Hua Fu Kang Biological Technology Co. Ltd. Neural stem cells from rats of ischemic stroke nerve injury and control rats were isolated and identified by Beijing Hua Fu Kang Biotechnology Co., Ltd.
SPSS 14 was used to carry out statistical analysis. One-way ANOVA was used to do the comparison between groups. Difference between groups was considered significant at P <0.05. 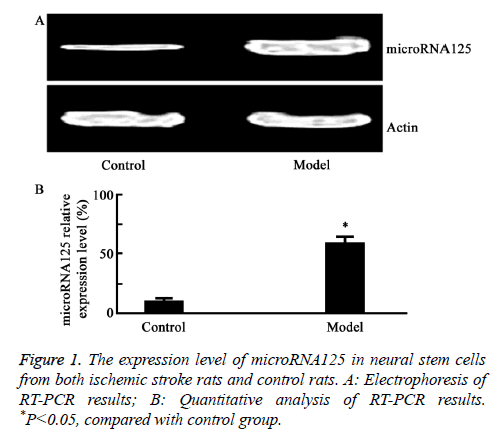 As shown in Figure 1, RT-PCR results showed that the mRNA expression level of microRNA125 was increased in brain stem cells of rats with ischemic stroke, compared to that of the controls (P=0.017). Figure 1: The expression level of microRNA125 in neural stem cells from both ischemic stroke rats and control rats. A: Electrophoresis of RT-PCR results; B: Quantitative analysis of RT-PCR results. *P<0.05, compared with control group. As shown in Figure 2, compared with the control group, transfection of microRNA125 siRNA significantly lowered the expression level of microRNA125. Moreover, transfection of microRNA125 siRNA significantly inhibited the growth of RNSC-FMU1 cells (P=0.0081). Figure 2: Inhibition of microRNA125 suppressed the growth of RNSC-FMU1 cells. A: Electrophoresis of RT-PCR results; Quantitative analysis of RT-PCR results; B: Percentage of live cells (%). *P<0.05, compared with control group. Flow cytometry analysis results showed that inhibition of MicroRNA125 by siRNA significantly induced RNSC-FMU1 apoptosis and the activity of caspase-3, compared to control group (P=0.0082) (Figures 3 and 4). 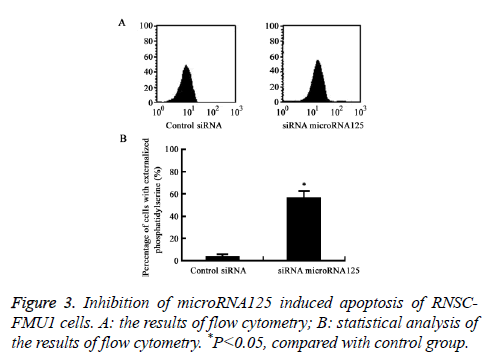 Figure 3: Inhibition of microRNA125 induced apoptosis of RNSCFMU1 cells. A: the results of flow cytometry; B: statistical analysis of the results of flow cytometry. *P<0.05, compared with control group. 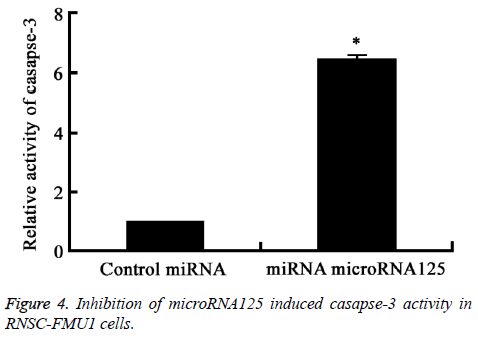 Figure 4: Inhibition of microRNA125 induced casapse-3 activity in RNSC-FMU1 cells. Inhibition of microRNA125 by siRNA significantly induced the casapse-3 activity. *P<0.05, compared with control group. Figure 5 showed that compared to control group, transfection of microRNA125 enhanced the growth of RNSC-FMU1 neural stem cells with no induction of apoptosis (P=0.019). Figure 5: Transfection of microRNA125 enhanced the growth of RNSC-FMU1 cells without induction of apoptosis. A: relative expression levels of microRNA125; B: percentage of living cells; C: relative activity of casapse-3. *P<0.05, compared with control group. Ischemic stroke is one of the most important and difficult topics in the medical science [6-8]. The brain damage repair has been restricting the recovery and treatment of this disease. One of the reasons is the lack of understanding of the process of neural damage in ischemic stroke [3,9]. MicroRNA is involved in many biological processes [1-3]. But the role of microRNA in ischemic stroke is still needed to be further explored. In order to understand the molecular mechanism of nerve injury in ischemic stroke, gene chip technology was used by our lab to study genes, especially microRNAs, differentially expressed in the process of nerve injury in ischemic stroke. We found that the level of microRNA125 was significantly increased (up to 43 times) in the course of ischemic stroke. Therefore, microRNA125 was chosen for this study. This study explored. The microRNA125 level in nerve injury of ischemic stroke was measured. We also found that microRNA125 affects the growth and apoptosis of RNSC-FMU1 cells [20-22]. We showed that: (1) the level of microRNA125 in neural stem cells of ischemic stroke model was significantly higher than that in normal neural stem cells. (2) antisense siRNA targeting microRNA125 can reduce the growth of RNSC-FMU1, and induce the apoptosis of RNSC-FMU1. (3) Overexpression of microRNA125 promotes the growth of RNSC-FMU1 cell line and reduces the apoptosis of RNSC-FMU1 cells. The results suggest that the level of microRNA125 may be related to the repair of ischemic stroke damaged neural stem cells, which is consistent with previous studies [23-25]. It is worth to mention that this study does not have the in vivo study of microRNA125 [26-28]. Effect of microRNA125 on different stages of ischemic stroke also needs to be further explored and more animal’s numbers need to be used in the future study. In summary, the data suggest microRNA125 is highly expressed in nerve injury of ischemic stroke rat model.MicroRNA125 expression might be used as a potential biomarker for nerve injury in ischemic stroke. Lowering levels of microRNA125 can decrease the growth ability and induce apoptosis of RNSC-FMU1 cells. Increasing the expression levels of microRNA125 can enhance the growth ability and decrease the apoptosis of RNSC-FMU1 cells. The data of this study are of great significance for the development of new anti-ischemic stroke drugs. Ay I, Nasser R, Simon B, Ay H. Transcutaneous cervical vagus nerve stimulation ameliorates acute ischemic injury in rats. Brain Stimul 2015; 15: 1230-1239. Chen HH, Zhang N, Li WY, Fang MR, Zhang H, Fang YS, Ding MX, Fu XY. Overexpression of brain-derived neurotrophic factor in the hippocampus protects against post-stroke depression. Neural Regen Res 2015; 10: 1427-1432. Sun K, Fan J, Han J. Ameliorating effects of traditional Chinese medicine preparation, Chinese materia medica and active compounds on ischemia/reperfusion-induced cerebral microcirculatory disturbances and neuron damage. Acta Pharm Sin B 2015; 5: 8-24. Jin X, Wang RH, Wang H, Long CL, Wang H. Brain protection against ischemic stroke using choline as a new molecular bypass treatment. Acta Pharmacol Sin 2015; 36: 1416-1425. Li LH, Tian XR, Hu ZP. The key target of neuroprotection after the onset of ischemic stroke: secretory pathway Ca(2+)-ATPase 1. Neural Regen Res 2015; 10: 1271-1278. Lv W, Li WY, Xu XY, Jiang H, Bang OY. Bone marrow mesenchymal stem cells transplantation promotes the release of endogenous erythropoietin after ischemic stroke. Neural Regen Res 2015; 10: 1265-1270. Doeppner TR, Herz J, Gorgens A, Schlechter J, Ludwig AK, Radtke S, de Miroschedji K, Horn PA, Giebel B, Hermann DM. Extracellular vesicles improve post-stroke neuroregeneration and prevent postischemic immunosuppression. Stem Cells Transl Med 2015; 4: 1131-1143. Madathil SK, Saatman KE. IGF-1/IGF-R signaling in traumatic brain injury: impact on cell survival, neurogenesis, and behavioral outcome. Boca Raton (FL): CRC Press/Taylor Francis 2015. Nakano T, Irie K, Hayakawa K, Sano K, Nakamura Y, Tanaka M, Yamashita Y, Satho T, Fujioka M, Muroi C, Matsuo K, Ishikura H, Futagami K, Mishima K. Delayed treatment with ADAMTS13 ameliorates cerebral ischemic injury without hemorrhagic complication. Brain Res 2015; 1624: 330-335. Li Y, Tang G, Liu Y, He X, Huang J, Lin X, Zhang Z, Yang GY, Wang Y. CXCL12 Gene therapy ameliorates ischemia-induced white matter injury in mouse brain. Stem Cells Transl Med 2015; 4: 1122-1130. Otero-Ortega L, Gutierrez-Fernandez M, Ramos-Cejudo J, Rodríguez-Frutos B, Fuentes B, Sobrino T, Hernanz TN, Campos F, Lopez JA, Cerdan S, Vazquez J, Díez-Tejedor E. White matter injury restoration after stem cell administration in subcortical ischemic stroke. Stem Cell Res Ther 2015; 6: 121. Fang L, Gao H, Zhang W, Zhang W, Wang Y. Resveratrol alleviates nerve injury after cerebral ischemia and reperfusion in mice by inhibiting inflammation and apoptosis. Int J Clin Exp Med 2015; 8: 3219-3226. Zhang Y, Li H, Huang M, Huang M, Chu K, Xu W, Zhang S, Que J, Chen L. Paeoniflorin, a monoterpene glycoside, protects the brain from cerebral ischemic injury via inhibition of apoptosis. Am J Chin Med 2015; 43: 543-557. Khan M, Dhammu TS, Matsuda F, Baarine M, Dhindsa TS, Singh I, Singh AK. Promoting endothelial function by S-nitrosoglutathione through the HIF-1α/VEGF pathway stimulates neurorepair and functional recovery following experimental stroke in rats. Drug Des Devel Ther 2015; 9: 2233-2247. Zhang DS, Liu YL, Zhu DQ, Huang XJ, Luo CH. Point application with Angong Niuhuang sticker protects hippocampal and cortical neurons in rats with cerebral ischemia. Neural Regen Res 2015; 10: 286-291. Xiao Y, Hafeez A, Zhang Y, Liu S, Kong Q, Duan Y, Luo Y, Ding Y, Shi H, Ji X. Neuroprotection by peripheral nerve electrical stimulation and remote postconditioning against acute experimental ischaemic stroke. Neurol Res 2015; 37: 447-453. Charles MS, Drunalini Perera PN, Doycheva DM, Tang J. Granulocyte-colony stimulating factor activates JAK2/PI3K/PDE3B pathway to inhibit corticosterone synthesis in a neonatal hypoxic-ischemic brain injury rat model. Exp Neurol 2015; 272: 152-159. Jiang Y, Li L, Tan X, Liu B, Zhang Y, Li C. miR-210 mediates vagus nerve stimulation-induced antioxidant stress and anti-apoptosis reactions following cerebral ischemia/reperfusion injury in rats. J Neurochem 2015; 134: 173-181. Tan X, Chen Y, Li J, Li X, Miao Z, Xin N, Zhu J, Ge W, Feng Y, Xu X. The inhibition of Cdk5 activity after hypoxia/ischemia injury reduces infarct size and promotes functional recovery in neonatal rats. Neuroscience 2015; 290: 552-560. Jiang Y, Li L, Liu B, Zhang Y, Chen Q, Li C. PPARγ upregulation induced by vagus nerve stimulation exerts anti-inflammatory effect in cerebral ischemia/reperfusion rats. Med Sci Monit 2015; 21: 268-275. Stary CM, Xu L, Sun X, Ouyang YB, White RE, Leong J, Li J, Xiong X, Giffard RG. MicroRNA-200c contributes to injury from transient focal cerebral ischemia by targeting Reelin. Stroke 2015; 46: 551-556. Song T, Liu J, Tao X, Deng JG. Protection effect of atorvastatin in cerebral ischemia-reperfusion injury rats by blocking the mitochondrial permeability transition pore. Genet Mol Res 2014; 13: 10632-10642. Chi NF, Liu HL, Yang JT, Lin JR, Liao SL, Peng BH, Lee YT, Lee TH. Neuroprotective mechanism of BNG-1 against focal cerebral ischemia: a neuroimaging and neurotrophin study. PLoS One 2014; 9: 114909. Srinivasan A, Aggarwal A, Gaudihalli S, Mohanty M, Dhandapani M, Singh H, Mukherjee KK, Dhandapani S. Impact of early leucocytosis and elevated hs-crp on delayed cerebral ischemia and neurological outcome following subarachnoid hemorrhage. World Neurosurg 2016. Ramos-Cejudo J, Gutierrez-Fernandez M, Otero-Ortega L, Rodriguez-Frutos B, Fuentes B, Vallejo-Cremades MT, Hernanz TN, Cerdan S, Diez-Tejedor E. Brain-derived neurotrophic factor administration mediated oligodendrocyte differentiation and myelin formation in subcortical ischemic stroke. Stroke 2015; 46: 221-228. Chechneva OV, Mayrhofer F, Daugherty DJ, Krishnamurty RG, Bannerman P, Pleasure DE, Deng W. A Smoothened receptor agonist is neuroprotective and promotes regeneration after ischemic brain injury. Cell Death Dis 2014; 5: 1481. Song S, Park JT, Na JY, Park MS, Lee JK, Lee MC, Kim HS. Early expressions of hypoxia-inducible factor 1alpha and vascular endothelial growth factor increase the neuronal plasticity of activated endogenous neural stem cells after focal cerebral ischemia. Neural Regen Res 2014; 9: 912-918. Tu Q, Cao H, Zhong W, Ding B, Tang X. Atorvastatin protects against cerebral ischemia/reperfusion injury through anti-inflammatory and antioxidant effects. Neural Regen Res 2014; 9: 268-275.